This is a movie that is filmed by you and only you. 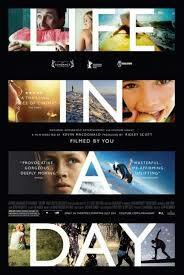 Life in a Day, is a compilation of video clips that comprise from one day (July 24th 2010). Filmed and uploaded to YouTube, the best of best was handpicked by Ridley Scott and Kevin McDonald and weaved into a full length feature. There were over 80,000 submissions from 140 different countries and it was good to see different cultures and climates. It starts chronologically with the passing of the 23rd to the 24th over midnight and showing footage of a drunk and people getting up early to pray. Then morphs into a movie experience you rarely get to see. The editing and transitions breathed life into the new segments. The visuals, stories and musical score were amazing. The film features clips of such things as a teenager’s first shave, a marriage proposal and a Korean man who’s travelled the world for 9 years with only his bike. You couldn’t help but smile at some of the stories. Then the heartbreak stories; the untold behind the scenes of an abattoir (animal cruelty involved) and a mother who’s going through cancer. It is a wonderful mix of happy and sad clips. The movie is an absolute joy to watch from start to finish. Smiles, laughs, anger and tears all are mixed together in 95 minutes of all-out pleasantness. If this comes out on dvd, bluray or television, WATCH IT! You won’t regret it. It’s an amazing visual experience with stories of hope, love, anguish, fear and life itself. Simply put, it’s your life in another person’s world in one day.